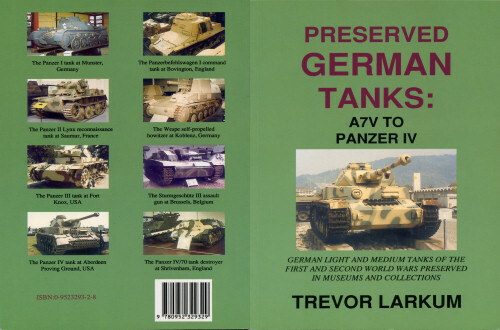 This book details the many historic German armoured vehicles that have been preserved around the world. It contains vehicles on display by themselves (for example, battlefield memorials and relics) as well as those in public museums and collections. It also contains some vehicles, owned by these museums and collections, which require restoration and are therefore not openly displayed at present. This is believed to be the only complete source of information giving details of what German tanks have been preserved and where they can be seen. For many it will come as a surprise that many fascinating but very rare vehicles such as the A7V, Panzerjäger I, Schwere Minenräumer, Flammpanzer III, Waffenträger and Panzer IV/70 Zwischenlösung are still in existence and can be seen and photographed. It is intentional that the rarer vehicles receive as much coverage as the more common ones since information on the latter is much easier to come by from other sources. The visual distinctions between the different models of each vehicle have been covered in detail since this is information that is of interest to many people (modellers particularly) but can usually only be found by scouring specialist publications. At the start of each section information is given on the vehicle specification (armament, armour thickness, and so on); it should be noted that this information is given in the following sections only where it differs from that in the previous section. Since chassis numbers are not yet available, and there is no other register of these vehicles, it is planned that vehicles will have a unique reference number in each series, for example the PzKpfw IV that used to be at Bovington, then went to Munster, then to Trier, and is now back at Munster (restored and in new markings) can always be identified as “Preserved German Tanks: PzKpfw IV Number 4” or “PGT: PzIV #4”. This will be true in all future editions, even though new vehicles are likely to be added. To aid in this and to avoid confusion, all vehicles will be cross-referenced between series. Finally, for those interested in statistics, this volume details 140 preserved vehicles.